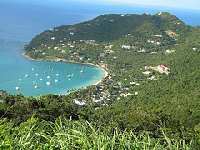 Cane Garden Bay is Tortola's most popular beach and a favourite anchorage for sailors. It's also the preferred location for swimmers, sunbathers and water-sports enthusiasts. The area is the centre of the island's nightlife, featuring seaside bars, restaurants and Caribbean-style entertainment. Travellers will find a number of villas and guesthouses around the curved bay, as well as rentable water-sports equipment, and gift shops. Tourists who prefer quieter beaches should avoid peak season, as Cane Garden Bay is a favourite drop-off spot for cruise ships and can become very crowded.